NYC-based (National) digital agency, Mitra Creative, is doing exciting work for our clients. We have almost a decade-and-a-half of experience helping our clients to convert business with their marketing platforms. Now, we want to grow our client portfolio. 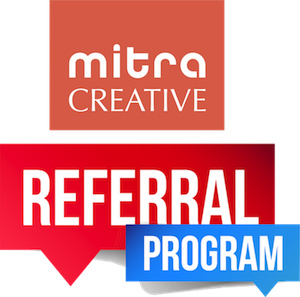 We’re making a special offer through April 30, 2019, to Mitra Creative friends and family, to our business partners, and to other close associates who refer business to us. Your simple referral will equal referral fees on any business closed based on that referral. We’re offering, for this limited period (until 4/30) referral fees of up to 20%(*) for the entire life of the project (including ongoing annuity work). Please contact Karl Ufert at (917) 921-4552, or by using the form on our Contact Page [CLICK ON THIS LINK OR THE BUTTON BELOW].